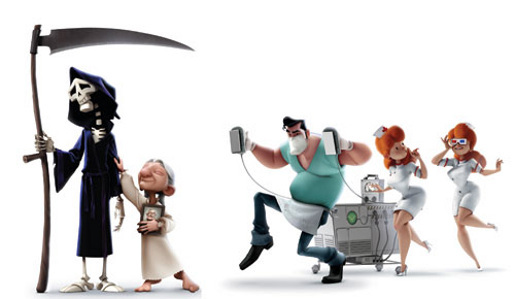 The Lady and the Reaper (La dama y la muerte), a short film by Spanish director Javier Recio Gracia, has been nominated for Best Animated Short Film at the 2010 Academy Awards. A sweet old lady is living alone in her farm, waiting for the arrival of death to meet her beloved husband again. One night, while sleeping, her life fades out and she is invited to cross death’s door. Bue when she is about to do so, the old lady wakes up inside a hospital’s ward. An arrogant doctor has brought her back to life and will fight hard against death to recover the old lady’s life at any cost. Animation was directed by Javier Recio Gracia via Kandor Graphics with producers Manuel Sicilia and Antonio Banderas.